Investors have caught a mild case of the Monday blues. 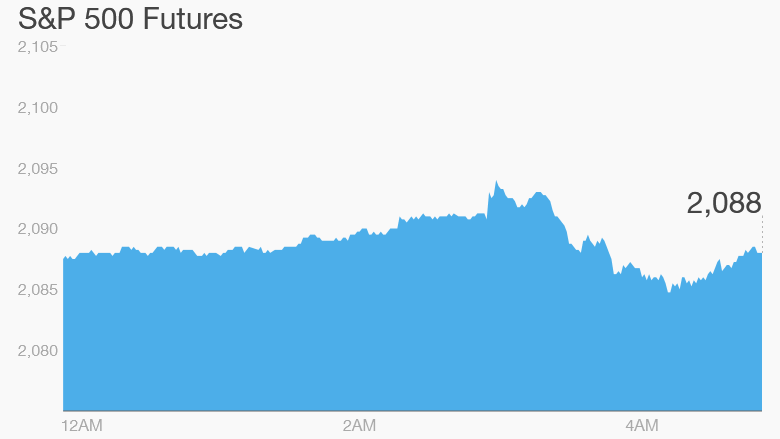 U.S. stock futures were inching lower and oil prices remained under pressure. 1. Oil slides: Crude dropped 1.5% to hover just above $41 a barrel in electronic trading. Oil has tumbled in recent weeks as the combination of plenty of supplies and sluggish demand weighs on prices. 2. Ruble tumbles: Weak oil prices are causing problems for Russia's energy-dependent economy. And there was more bad news Monday, as the ruble hit a 6-month low against the greenback. 3. Earnings updates: There are a few company results to watch out for today, starting with earnings from Estee Lauder (EL) before the market open. Urban Outfitters (URBN) will report this afternoon. 4. International markets: It was a mixed session across global markets. In Europe, Germany's DAX rose 0.4% while the U.K.'s FTSE index inched down 0.1%. Over to Asia, China's Shanghai Composite closed up 0.7% and the yuan was steady against the U.S. dollar. The stabilization in the Chinese currency helped restore some calm to trading after a surprise devaluation sparked a sell-off on global markets last week. Japan's economic recovery hit another stumbling block as data showed GDP contracted in the second quarter. The country's benchmark Nikkei index added 0.4%. Hong Kong's Hang Seng closed down 0.7%. 5. Friday market recap: It was a positive end to the week for U.S. investors. The Dow Jones industrial average and the S&P 500 each put on 0.4%, while the Nasdaq added 0.3%.